Second 3D movie of the year, I have to admit – I wasn’t blown away by it. “From the director of Night Before Christmas”, I didn’t really like that either. 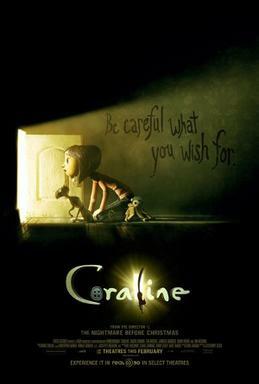 The story was enchanting but a bit slow and somewhat scary for kids I thought. The early-teen goths will probably love it though. It was announced yesterday that my home city of Manchester will be the first to trial the new ID card scheme. This subject has been dragging on for a while now and it raises several points for me. Firstly and coincidentally I’ve been watching a lot of the traffic cops style programmes that seem to have come back in style on TV and one of the problems they often have is the initial ID of the driver who is not required to carry documents but has to be checked in order to determine whether they are legal to drive or not. For me this appears to be a foremost reason for an ID card scheme, but hang on don’t most of us already carry this driving license thing for this purpose? Why not just make it compulsory to have it with you when driving? If you want biometrics then beef it up not add a whole new card. But what if you don’t drive? Then I suppose fine have a separate card but I don’t see why drivers must have both. Also we are being pushed towards needing Biometric Passports, again I don’t disagree with the reasoning but why charge £30 for the Biometric data collection when many people will already have had this data collected for there passport? There’s also the issue of charging citizens to purchase a card, why do this? Either make it compulsory and raise the money through taxes, etc or nobody will volunteer to buy one. The other issue I’ve been pondering about is why launch in Manchester? Recently it seems Manchester has turned into a testing site for national projects. I suppose the makeup of the city means if it works here then it may work for the country. It’s not too large a city to become cumbersome, it can organise itself to vote in a referendum so it can be shown to weigh up issues well. I’m so excited about this that I’m posting early about it. I booked our tickets for the IMAX showing a couple of weeks ago and the reviews I trust are starting to come in and they’re all positive. But let’s face it loads of people would go regardless (look at Wolverine for example). I suppose my Star Trek journey has been a long and twisty one. The only comparison I have is Star Wars but it’s not the same, I’ve liked Star Wars more intensely but I suppose that’s to do with there being less of it. With Star Trek you can literally watch it for days, or read about it. It has one of those immensely fiddly worlds with a need for continuity, things that happen that take you away from it’s self perpetuating continuity must be explained. I started with the Original series repeats on BBC2 they used to be on just before dinner was ready and progressed on to next generation, deep space nine and voyager. Now Virgin 1 is showing everything too and it’s wonderful to dip into. Enterprise was a bold step, and I think it’s still improving but I just want the Xindi thing to be resolved already. The film was amazing! Just great, loved pretty much every minute. We’ll probably go and see it again. Casting was great. I was worried about Simon Pegg in it but he pulled it off, ‘Sylar’ was great as Spock and Chris Pine was a good Kirk. Phil Plait has done a blogpost about the science of it. Reviews wise there’s millions of them out there, not even sure if i’ve seen a bad one! Empire Magazine Review. Forgot to mention, finally got round to watching the Red Dwarf special over the weekend too. Verdict? Meh, but then always only thought Red Dwarf was so so anyways (bring on the scorn). Woody Allen’s latest, well when I say latest latest one I know about – he’s already done one since. This one featured well at the Oscars, Best Performance by an Actress in a Supporting Role for Penélope Cruz, who was awesome in it. She’s often great when in films in her mother tongue.. Before we started we had a bit of a discussion about Woody Allen himself, does the marriage thing mean that his films can’t be enjoyed? I’m not so sure so I’ll take each film as it comes. This one for me though was so so. The characters never feel real, or live in a real world. Money is of no consequence, nor time but only morals. The photography however is beautiful it just milks the “we’re artists” bit too much, “I bought this house from an artist friend of mine”. have now worked out what it was that bugged me in the film, it was the completely unnecessary voiceover. Where was the character that was doing it? Why were they explaining the things I can see before my eyes? When Clint Eastwood directs a film usually you know it’s going to be a little preachy and he’ll star in it, and growl some. Well now he’s said this will be the last one he’s going to be in and it was a great one to bow out on. Wasn’t sure at first whether it would turn out to be good but I got pulled into the story and the characters and was laughing at Walt Kowalski’s fight against the world changing around him. From his awful family to a neighbourhood changing beyond recognition and how he became friends with the family next door. I really liked this film. I want to be able to say it’s a warm film but I can’t. It’s just one man’s solution to the problems he sees around him. There were some wonderful performances as well, in particular the two kids from next door, Sue and Thao played by Ahney Her and Bee Vang who had not appeared in anything else before. Kate and I both have bikes that we haven’t touched for 3 years. Despicable I know! We moved to our flat which is in kind of a hilly area and just forgot all about them really. Mine is a blue Raleigh and hers is a fold up bike we got from Freecycle. So we’re on a bit of a health kick at the moment and decided that this bank holiday we’d like to go for a ride. However it took us so long to clean up the bikes that in the meantime it had started raining! So we’ll go soon. We might even have a bike rack for the car coming to us, so maybe we’ll go for a trip out! I bought a cycle computer for mine, which i’ve fitted but haven’t managed to get working yet. So i’m a bit annoyed with that. Update: Got it to work now, and Kate’s pretty much finished painting up her bike which looks awesome! Typically though since we started this project the weather has been awful… Just a puncture in my back tyre, a seat adjustment and to fix the rear brakes on her bike and we might actually be able to go for a cycle this weekend! Everyday I read a number of website feeds to catch up on various things and i’ve used Bloglines since Rob showed it to me a few years ago. I’d tried Google Reader but didn’t quite get on with it and I wanted a web based one vs a desktop one as I wanted to be able to read it wherever I was. Just noticed that in Bloglines beta version there a command line prompt! Just press the ` (left of 1 key) key and see what happens. As usual not much being said about the upcoming election, at least I managed to find out who’s standing this year. At first I was a little dissapointed that the film dwelled so little on Wolverine’s early war years but quickly realised that as far as the story is concerned it’s irevelevant the the title sequence does very well at getting across what it needs to. I’m a sucker for Origins films, and wondered beforehand whether this would be the start of a glut of X-Men origins films and having seen it I hope not, they wouldn’t be able to compete with this one – and it also kind of shows a few of the other X-Men too. Went to the Bury Vue Cinema to see it which is usually a good experience, we go for a meal beforehand and wander over for the next showing. However this time was a little concerning with Bag Checks and staff walking to the front of the cinema during the film to spy on us and most furiatingly walking from one side of the screen to the other!! Trailer wise all of them seemed very strong, Harry Potter, one called 12 Rounds? Angels & Demons. Good stuff looking forward to them all.